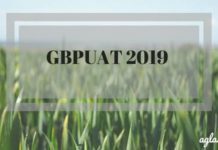 GBPUAT 2018 Application Form is now available. 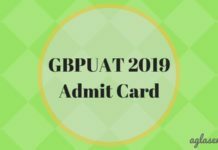 GBPUAT 2018 Application Form is available online. Candidate can register themselves on the official website of the university. 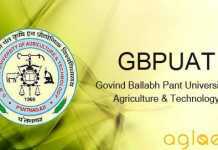 Govind Ballabh Pant University of Agriculture and Technology is the conducting body of the GBPUAT entrance exam. 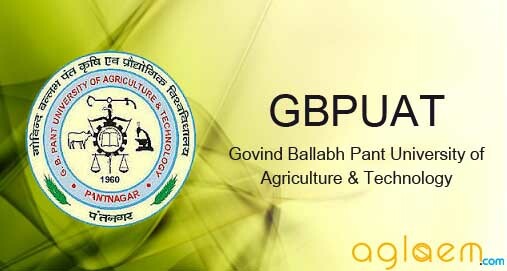 Candidates who wish to take admissions in Govind Ballabh Pant University of Agriculture and Technology should register themselves for the GBPUAT exam. Candidates are required to fill the application form without any mistakes within the specified dates. Get the complete details of GBPUAT Application Form 2018 such as how to apply, application fees, submission, and deadlines on this page. Latest: Online Application Form is now available, candidates can register online from the link given below. Candidates can apply for GBPUAT Entrance Examination 2018 from the official website. The official website of the university where the candidates can register themselves is www.gbpuat.ac.in. Candidates can apply through this page as well. The link to the application form is also provided below. Click here to Register for GBPUAT 2018. Click here to Log In for GBPUAT 2018. Candidates should download the Prospectus from the official website of GB Pant University. Candidates should read the prospectus carefully to ensure that they fulfil all the eligibility criteria laid down by the university. Candidates are advised to apply online for the form and can also check the step by step instruction to filling online application below. Candidate should visit the official website. Click on the apply now tab available on the website. Fill in all the details asked in the application form. Save the application form for future. Photograph must be a recent passport style colour picture. Ensure that the size of the scanned image is not more than 50kb. If the size of the file is more than 50kb, then adjust the settings of the scanner OR adjust the size of PHOTO in Paint or any other Picture Tools. The applicant has to put the signature on white paper with Black/Blue ink pen. The signature will be used to put on admit card and wherever necessary. If the Applicant’s signature on the answer script, at the time of the examination does not match the signature on the admit card, the applicant will be disqualified. The applicant has to put left-hand thumb impression on white paper. After Scanning Ensure that the size of the scanned image is not more than 20kb. The Applicant can submit fee by Online, the Applicant can pay the fee via, Debit Card / Credit Card / Internet Banking. Applicants are advised to keep with them the copy of the “Online Fee Receipt” as a token of remittance of fee for future reference. On successful registration of the on-line application, Applicant’s are advised not to attempt for registration since multiple registration numbers and passwords may create the problem for Applicant in future. In case of multiple registrations for the same Course/Group, the candidature is liable for cancellation/rejection without any prior notice/intimation to the Applicant. Candidates are supposed to fill the form online but take a printout and submit it to the office via post. Candidates must ensure to dispatch the Confirmation Page after online filling of application form along with the documents listed below. Self-attested copy of Certificate/Mark sheet of the qualifying examination. Self-attested copy of High School Certificate. Note: The candidate must retain a photocopy of his/her filled in Confirmation Page and Fee receipt for future correspondence. Candidates are requested to apply via one mode only online. Candidates are requested to enter a valid e-mail ID in the Application Form. The Registration number, password, admit card for written test and call letter for counselling or any other important communication will be sent on the same registered e-mail ID of the candidate (also check email in spam box). Candidates are requested to check regularly their e-mail for any communication from GBPUAT. Candidates are advised not to disclose their login password to any other candidate/person. Candidates should take utmost care to furnish the correct details while filling in online application. Candidates should complete all the steps of filing the exam form before the last date. Application once submitted will not be allowed to be withdrawn and fee once paid will not be refunded. hello sir, my gate score is 377 with AIR 14383 and my b.tech percentage is 56. so please suggest me in which college i can apply or i have to apply. please help me i am so confuse about that. what is the process for p.hd. ? can u please upload the entrance criteria and application procedure for bsc in genetics?